A tough, dependable rover and fierce competitor, Scott Wade’s record is one of the most decorated in the recent history of Tasmanian football. Post-playing career, he continued to serve the game as the most publicly visible and influential administrator in the state for more than 20 years. Born in 1960, Scott Wade’s football journey began as a teenager playing Under 18’s football with Hobart in 1976. He took out the Tigers’ Best and Fairest in that age group at year’s end, and the following year Wade made his senior debut aged 17. By 1980 he had not only cemented himself as a first-choice player at the Tigers but had won a Best and Fairest in the club’s premiership season of 1980 and represented his state at the 1980 Adelaide Carnival. A youngster making that sort of impact will always attract the attention of the mainland, and before long Wade had signed with Hawthorn and was travelling across Bass Strait to line up with the Hawks for the 1981 VFL season. Wade’s senior debut for the Hawks came in the penultimate match of 1981. The Hawks were belted by Collingwood, but Wade did enough to retain his place for the final game of the year. The following season produced eight senior appearances, but in 1983 Wade had trouble breaking into the Hawks ultimately premiership-winning midfield. Only two senior games spelled the end of Wade’s VFL career, and he returned to Tasmania and to Hobart for the 1984 season. Appointed captain-coach by the Tigers, Wade showed the football world what he was capable of immediately upon re-entering the TANFL, winning the William Leitch Medal in 1984 and back-to-back Hobart Best and Fairests in 1984-85, although as coach he was less successful, with Hobart claiming the wooden spoon in both of his years at the helm. After nine seasons and 138 games with the Tigers, Wade departed the club at the end of 1988 to join Clarence. The move paid dividends immediately, and Wade produced arguably the best season of his career in 1989, winning a second William Leitch Medal, captaining his state against Victoria and being awarded the Lefroy Medal as his state’s best interstate representative. The following season he was a member of the Tasmanian side that that sensationally upset Victoria at North Hobart Oval, however for all his achievements in football there remained just a single premiership medallion in Wade’s trophy cabinet; all that changed in 1993 with the appointment of Steve Wright as captain-coach of Clarence. 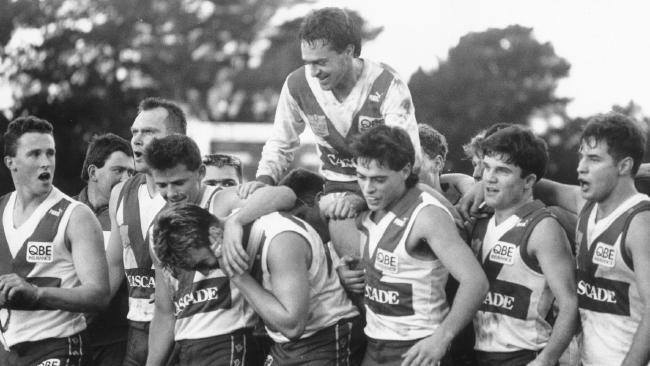 The former Sydney rover immediately turned the Roos into a powerhouse through the instillation of a strong work ethic, and premierships in 1993 and 1994 were the result, with Wade a member of both. After a short, one-year absence from the Roos during which he coached Kingston to the 1995 Huon Football Association premiership, Wade returned to Clarence for one final season in 1996, going out with a fourth premiership before retiring from senior football after 282 TFL games. During his final season, Wade had embarked on an administration career as General Manager of Clarence, replacing inaugural GM Bill Atwell. After more than three years in that role, he made the step up to General Manager and later CEO of Football Tasmania (later AFL Tasmania) in late 1999, performing the role with distinction for more than 15 years. His tenure oversaw many momentous events in Tasmanian football history, most notably the formation of the Tasmanian Devils Football Club in the VFL – the first true Tasmanian ‘state’ team – and the re-launch of state-wide football with the Tasmanian State League’s formation in 2008.